Car makers and car related companies make up about 1/3rd of all Super Bowl ads 2012. Car Super Bowl ads are among the favorite for Super Bowl commercial fans. 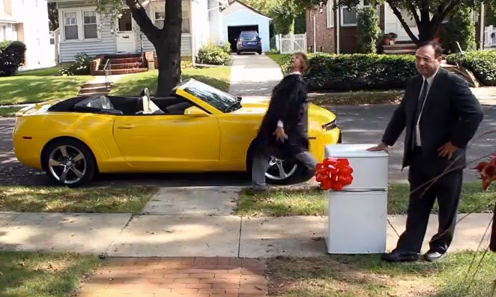 Last year Volkswagen and Chrysler took car ads to the next level in very different ways. Volkswagen ran one of the funniest, if not the funniest Super Bowl ad of 2011 and Chrysler landed with Eminem an epic and emotional Super Bowl ad with dramatic impact. This year Volkswagen gets a beating from Honda and Acura in the days leading up to the Super Bowl 2012. Jerry Seinfeld and Matthew Broderick are currently dominating the Super Bowl Ads Charts in terms of online views on Youtube. Below we put together the very long list of 2012 Car Super Bowl commercials. Besides Chrysler all car advertisers have released their Super Bowl ads already ahead of the Big Game. Chrysler is making a big secret out of their new epic Super Bowl Ad. The 2 minute Chrysler Super Bowl 2012 Ad is rumored to star Clint Eastwood. Click the links to watch the according car Super Bowl 2012 Ad. The Super Bowl 2012 is taking place in Indianapolis on February 5th, 2012. Watch already the first fully released Super Bowl 2012 Commercials online. Super Bowl Ads for Geeks is covering everything there is to know (Super Bowl 2012 Facts) about the Super Bowl 2012 Ads and more, leading up to the big game. The coverage on Super Bowl Ads for Geeks extends our famous Super Bowl for Geeks Guide on I4U News. See who the 2012 Super Bowl Advertisers are.